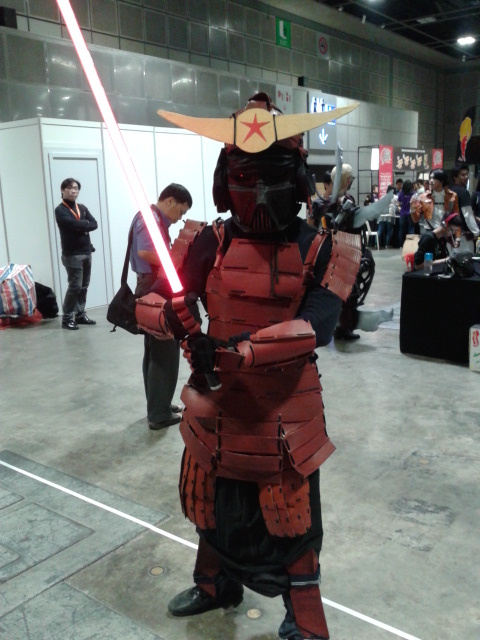 It’s been a long day Ogling at gir being Shogun Vader. I’ve done it. It wasn’t well executed, but I was impressed with myself. 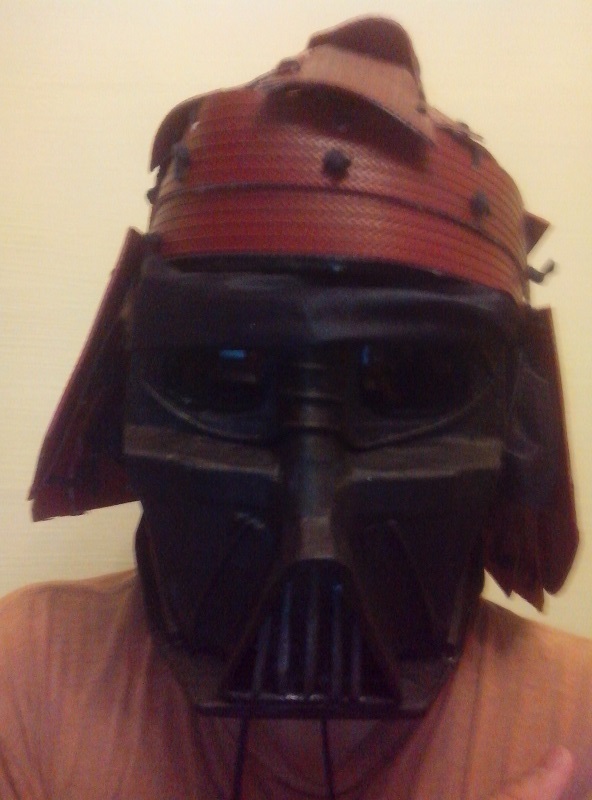 After all this ranting about creating the quite popular Internet Sensation Shogun Vader, I’ve decided to step up the cause and upgraded my old Samurai Suit into this abomination. It was really crude, I can tell you that. Barely able to make do with time, I had to rush to the License2Play Convention at Suntec for only the later half of the event’s 2nd day. No doubt that further tweaks can be made to improve the aesthetics of it. 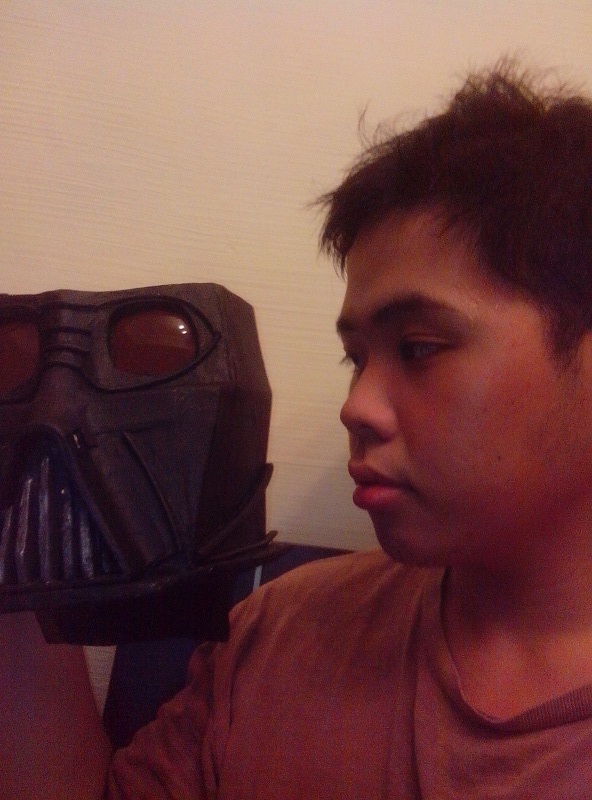 A few friends pointed out the flaws of my work that prevented me from achieving it’s peak potential, which I’ve learned alot from their experience in costuming, I’m still elated over the results of my work though.It wasnt as awe-inspiring as the other cosplayers at the convention, but I did this to prove a point, it’s possible to achieve a costume of this scale with the compromise of environmentally friendly concepts. 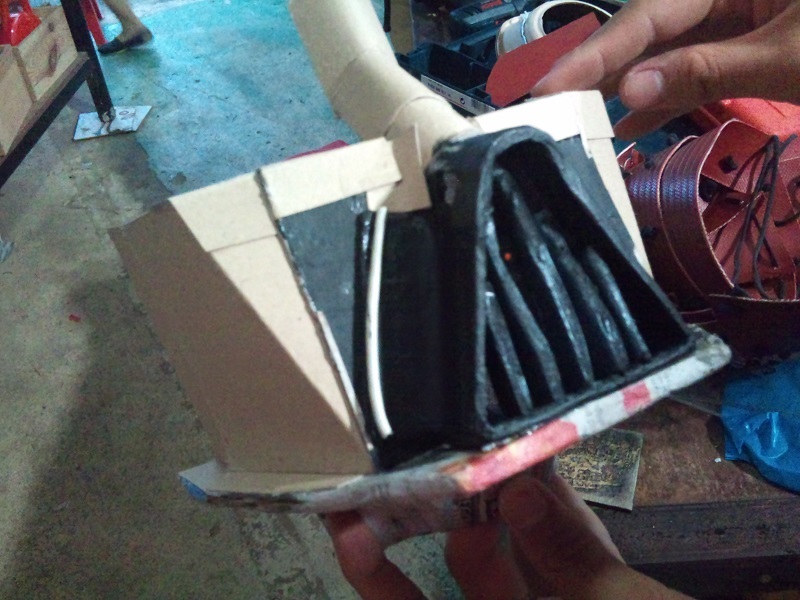 The creation of Shogun Vader was through materials that are upcycled through their once condemned state. 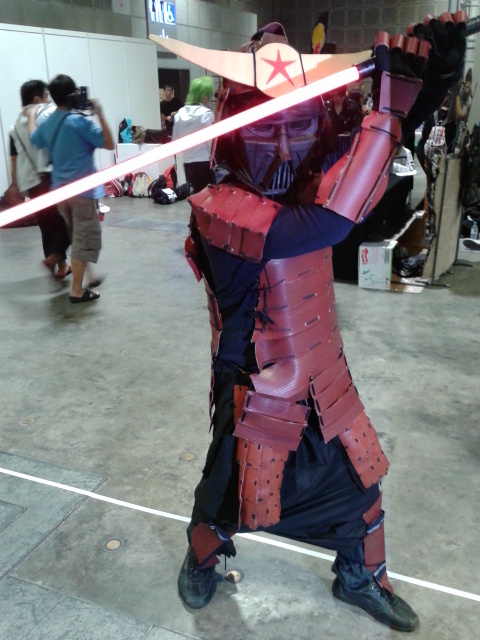 The Samurai Suit is largely comprised of Decommissioned fire hoses, and the Darth Vader Mask consisted of electrical Wires, Bottle Caps, cardboard and Old files. (Except for the point of using glue and paint, which weren’t practical to scour for it’s condemned version ). Hopefully with this inspiration I would pursue my future endeavours to be as equally stunning as the costumes from the other cosplayers I’ve met. Also thanking my brother for his assistance in photography and the Fightsaber team for allowing me to be part of their team for this convention. 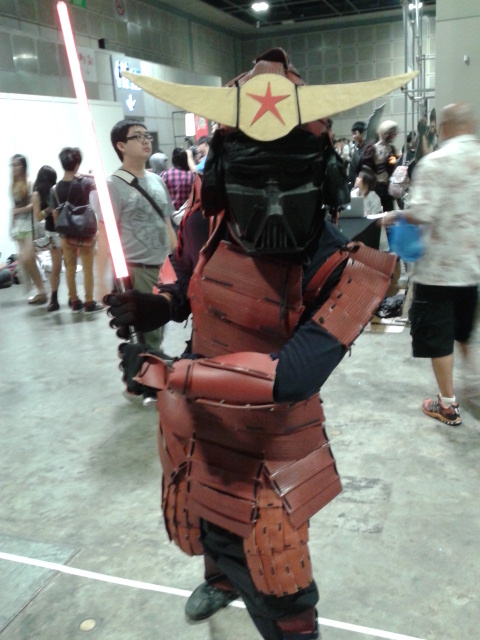 After my debut of the Samurai Suit in the NeoTokyo Cosplay Convention at the Scape Warehouse in August, my fascinations with costume/prop making has been greedily feeding onto my ambitions to head for projects of a larger scale. 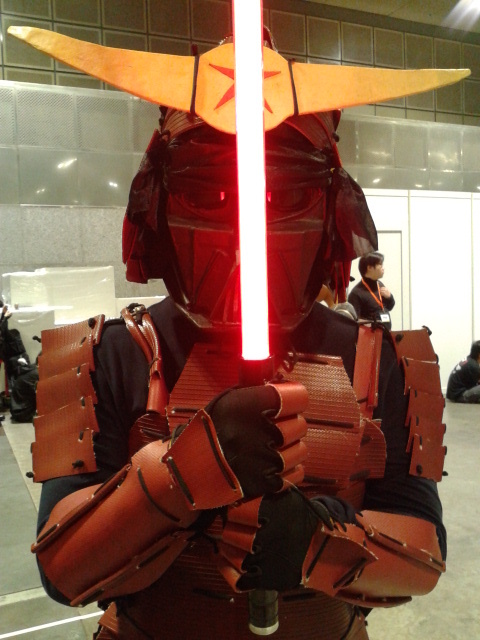 Being alone as a wondering Samurai can be fustratingly uneventful, which fortunately lured me into Fightsaber(A Star Wars Performance Group), and the members were very amiable with me, unlike the other crowds of cosplayers who werent as friendly. Initially, I was supposed to hook up upon a cosplayer group I’ve met on July, but the people at Fightsaber were more receptive, which was probably why I joined up their group weeks later, discovering my obsession in lightsaber fight choreography later on as I went to the weekly trainings. 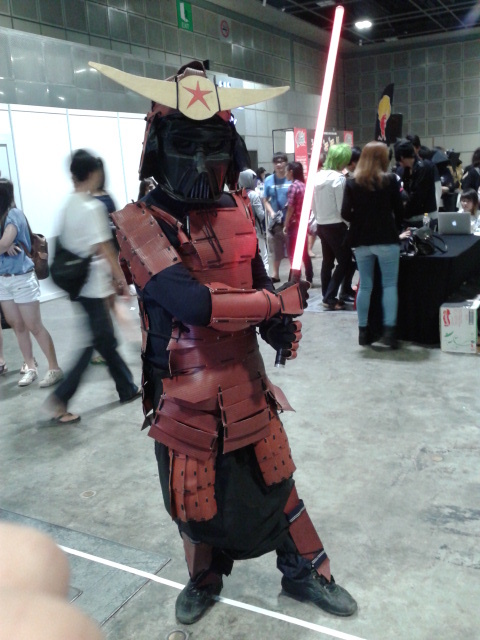 In my interests in innovating new challenges for my hobby, I’ve declared to make a “Shogun Vader” costume, in relation to my Samurai Suit. Yes, it’s upcycled with Bottle Caps, Electrical Wires, Old Files, Paper Mache Cardboard Combo and what-not, I’m sticking to the theme of upcycling. 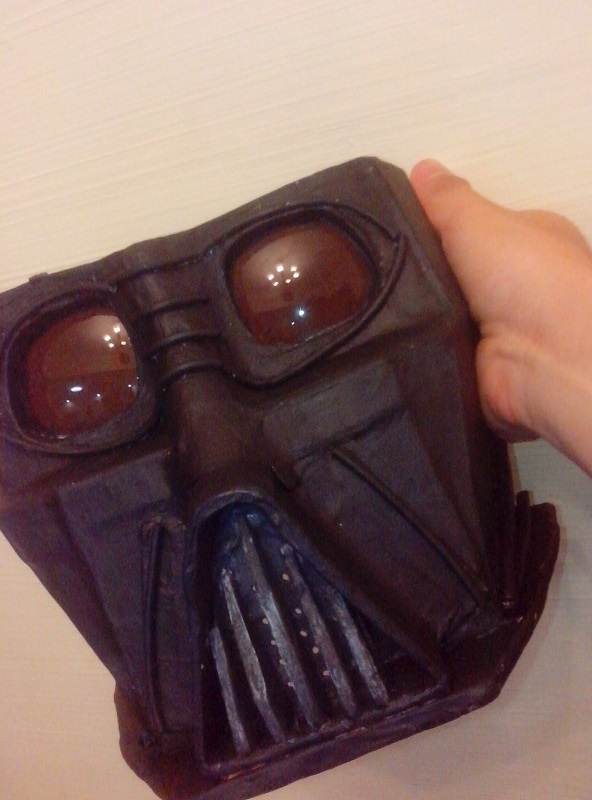 In light of writing this blog post late night, I’ve successfully completed the Darth Vader Mask in just about a week while juggling under National Slav Service. It was a pain in the arse TBH, but eventually I’ve completed within time for the License2play Convention at Suntec, which would be happening soon this afternoon…. it’s not 100% Vader and I’m sort of disappointed about that, but It’ll have to do. Oh, and I’ve made a few upgrades to my Samurai Suit, should look better than barebones 1.0 with the Vader mask, and with another Surprise waiting in store when I don on my political thinking cap. Ok, bad positioning on my helmet, and the mask is killing meh…. I’d better make some last minute changes before heading out to the convention, but running on a tight schedule in the morning isn’t going to help, so fingers crossed that it won’t fall apart. And finally to end off thanking SL2 for tolerating my eccentric hobbyism in the Lab.